Janine has specialized in pediatric physical therapy for over 25 years. She treats children of all ages and with varying diagnoses. Special interests and training include gait analysis and treatment, orthotics management, hypotonia and muscle disease, cerebral palsy and bleeding disorders. Janine sees patients upon physician referral. 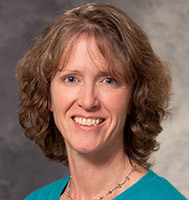 She holds a Bachelor of Science degree in physical therapy from UW-LaCrosse and a Master of Science degree in therapeutic sciences from UW-Madison.